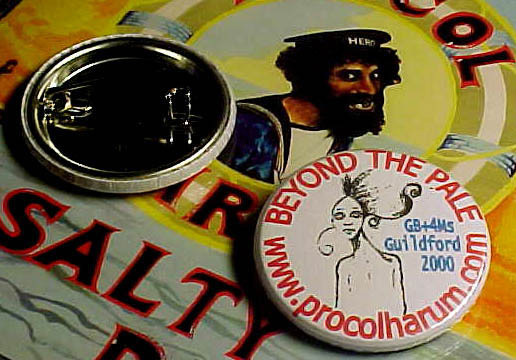 A confession: I was invited to play with the pick-up band at the Shine On / Beyond the Pale convocation at Guildford, the night before Procol Harum’s millennium gig, but declined. Lack of bottle? lack of rehearsal? lack of chops? I hastened to make my reply, found that I could only lie and like a fool I believed myself. I guess I expected something vaguely embarrassing, long on awe and short on precision. I was a nervous little train-spotter. Anoraxia nervosa. Appreciation societies tend to press the nostalgia button and this was no exception. Not that there is anything wrong with that. Few of us would see forty again. Some could already see very little without optical aids. And anyway nostalgia is just pleasurable anticipation in reverse, isn’t it? For myself, as I sat listening to Roland Clare and his pick-up band play a note-perfect Mabel (please get off the kitchen table), I was transported back to 1973. Because there on the guitar was genuine Procol graduate Dave Ball. In that year I went to the launch of his band Bedlam. They were a regulation heavy rock four piece with pedestrian material and standard issue demon-king vocals. Their footnote in the annals of rock’n’roll – if any – derives from the fact that the young Cozy Powell was on drums – he had already played with Jeff Beck. The venue achieved the impossible combination of being both cramped and cold. The reception was too early in the evening and the sandwiches already curly. One or two disinterested rock journalists picked at the pork-pie quarters. Frankly Chrysalis had not tried very hard. On the strength of his short stint with Procol, I suspected Ball of real talent, a charge I was able at close quarters to corroborate. He was not especially fast or technically proficient but his heart appeared to be connected to the outside world via his fingers. When he zipped into a solo you felt his angst in your guts. An unusual gift. Truth was I’d have been happy if I could have switched off the vocals and listened to the band as an instrumental unit. But what do I know? I felt the same about Led Zeppelin. The best thing about Robert Plant, I always said, was his record collection. I believe Willie Dixon held a similar view. Ball was tall, gangly, slightly awkward with a nervous placatory smile and a seriously gormfree expression when he soloed. He had of course replaced Robin Trower in Procol Harum and then himself left suddenly very soon after. The rumour was that there had been physical violence between him and drummer BJ Wilson. I’d seen how BJ hit those skins. I would not have wanted to come between BJ and his tom tom. And here now in the year 2000 at the bar at the Guildford Civic was that same Dave Ball, soloing for the train-spotters. Thumbing through Claes Johansen’s book which I had bought that day, I noticed that Ball attributed his departure to "some very, very slight differences" between himself and BJ. Listening to him wrenching hurt out of his SG on Conquistador, this was not, I concluded, a player who had been dropped as a result of anything slight. And that extra "very" worried me. How had it affected the intervening 20-odd years of his life? And Procol’s? I had not been able to avoid following his next career move because it was into Duffo’s band with my longtime mate and songwriting partner Sev Lewkowicz. Duffo was an Australian transvestite singer-songwriter and 1976 may have been the only time in world history when it was more unusual to be an Australian rock’n’roller than a singer-songwriter or indeed a transvestite. There were plenty of blokes singing in frocks in those far-off days and more singer-songwriters than you could point a stick at. And frankly more of them ought to have had sticks pointed at them. In time Duffo returned down-under relatively unacclaimed and I heard that Dave Ball went too. For all I knew he may have become a cross-dresser. Now he was something in computers, I gathered. For the rest of us plenty had happened since. Sev took jobs as – descending the food chain – keyboard player with Any Trouble, chef, painter-decorator, MD at a theatre school, waiter and, bottoming out, keyboard player with Mungo Jerry. I sold a lot of insurance, married twice and became father to six children. 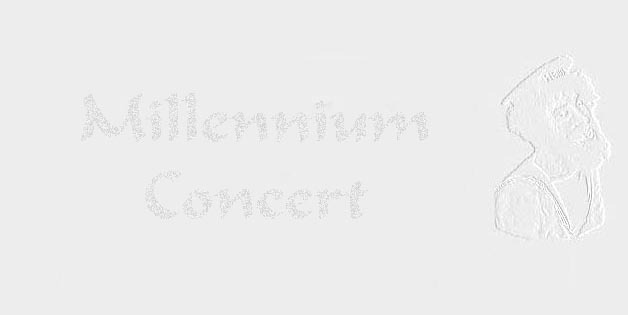 The Belgrano sank, the Berlin Wall came down, Procol Harum’s audience did not grow. In fact they disbanded for a decade. BJ went to join John Bonham, Keith Moon, Dennis Wilson and the bloke from Spinal Tap who choked on someone else’s vomit. Eventually Cozy Powell followed. What is it about drummers? "So are you still living in Oz?" I asked. "No mate," he replied like some antipodean Lorraine Chase. "Bournemouth. With my new family." He gestured at his very beautiful young wife. There was something likeably uncertain about him in his dungarees and bushranger coat. But was the sadness mine or his? What was he doing here? We were fans; he was the real thing. I wanted to ask about tomorrow. I understood both Mick Grabham and Geoff Whitehorn were playing. For me Grabham’s touch was always a little tentative and though Whitehorn reproduced Trower’s style with pizzazz and invention, well frankly I’d expect that of a man of his experience. Did one Ball equal a Whitehorn plus a Grabham? Roland’s band continued to work through the catalogue. At one point Gary Brooker himself sat in. And as I was first pleasantly surprised and then astounded by the sensitivity and competence of these brave men, I remembered something Brooker had said on the release of Homburg, as follow-up to Whiter Shade. Words to the effect that he was putting a spell on a few hundred thousand this time instead of several million. Many a true word, as they say. Perhaps it is inevitable that there will only be rare moments when music as serious in intent as this coincides with the public taste. A mate of mine reckoned it was karma. "How is it," he had asked rhetorically, "That Whiter Shade of Pale is one of the most recognised pieces of music ever recorded and the most familiar bit is Matthew Fisher’s Hammond motif and yet the writing credit is Brooker-Reid?" Gary Brooker is by all accounts a generous man and neither of us had any knowledge of whatever accommodation Brooker, Reid and Fisher may have come to over the years. Nonetheless that glorious alchemy of the two keyboards was only to be repeated while Fisher remained in the band. To what extent were these various facts connected? Back at the Civic Hall, an Italian with very little hair was doing a commendable job of Brooker’s vocals. Keyboard players including Roland Clare and my friend Sev, came and went. 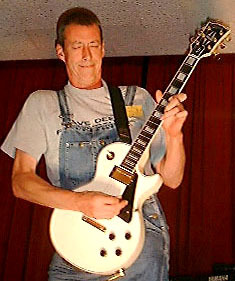 An American with a blue Strat grappled creditably with the Trower parts. Roland's son Peter Clare played imaginative trumpet. During the instrumental passage of Boredom a hundred middle-aged men called out rich and fruity as a single organism. People had come, the genial Scandinavian MC informed us, from as far as Chile. There would be sedate revelry later at the Yahwiss. We were invited to recognise some Procol cover versions. The one thing worse than not knowing the answers would be knowing them. "Put Annie Lennox down for everything," my 19 year-old son Alex advised. "What’s that bloke doing programming computers?" Tom asked. "He ought to be a legend." The view of a callow youth perhaps but one who had been speechless at Peter Green’s 1997 Guildford festival comeback and who had forced me with physical threats to buy tickets for King Crimson’s only British gig this year. "You’re right." I said, my spine equally chilled. I had not, as Roland Clare accused me, come to jeer but I was indeed to leave with regret. As it turned out, the only serious embarrassment of the night was Sev paying £26 for a Grand Hotel bar of soap in the charity auction. 97 on the saddometer. I was sitting with his wife Carol, watching her jaw fall as his bids rose. I can only imagine what piece of her mind she shared with him on the way home. She’s not a girl to miss an open goal. The affable Scandinavian announced the results of the competition. I’d got nothing right. My sons sighed with relief. Was the Yahwiss one of the Alps? Or a plant related to the edelweiss? "A variety of white chocolate is my bet," said Alex, sipping something red, sweet and nasty. "Or one of the missing books of the Old Testament," Tom suggested. I’ve seen the Hollies recently. I’ve seen all sorts of tribute bands and revived line-ups. Christ, I’ve even seen Mungo Jerry and that’s not an experience for the impatient. But these acts are 100% nostalgia. You have to suspend your disbelief and pretend that you can take seriously songs about bus stops and umbrellas, or indeed a bloody pushbike. These are the concerns of childhood. In 1967 Procol was already beyond these things. Their strength, I suspect and their failure. So the night wore on and I marvelled at Dave Ball’s concise passion, his lost future. I had no reason to suppose he was not entirely happy with his beautiful wife and his livelihood outside music. And I could not but admire the sheer chutzpah of the rest of the players. My sons left with me at the end making complimentary noises, though declining to revel with the wrinklies at the Yahwiss. I commended Roland Clare on his organisation and especially his kids, both nearby glowing with triumph. "You’re in serious danger of having a bonded family," I said. "An enviable rarity. On the other hand it may be that you horsewhip them in private." Oh and Procol played the next night. Any resemblance between this account and what really happened is entirely coincidental. If anybody is offended, I am (as Tom Lehrer used to offer) prepared not only to retract it but state in writing that I never said it in the first place. I hope it's clear what a good gig it was. 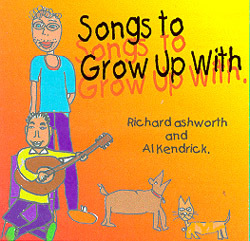 Richard Ashworth is a long-time Procoholic who lives in Surrey in a small house full of children. He co-wrote the album Echo by Gracious! with Sev Lewkowicz and has contributed material recently to albums by House and Nostromo.